Comments on "Purple Driving Mocs Are All The Rage"
Oh I love this! Beautiful rich colour, a bit different without being intrusive. God you have to give it to the Italians. When they get on a look, the do it with a vengeance. I can't imagine a look like this taking off here. But I love the way they embrace their inner-stylishness and just go for it. Where would menswear be without Italian men? OK...I must have these! (They're evidently worth creating a google account!) Anyone know who carries them? those shoes are the bomb-diggity!! I love them. With white pants they are just perfect! Would you wear them with any other color pants though? These shoes look great when worn with confidence, but are probably more of a fleeting trend. Regardless, these guys look HOTTT!!! The purple soled revolution begins, love it! 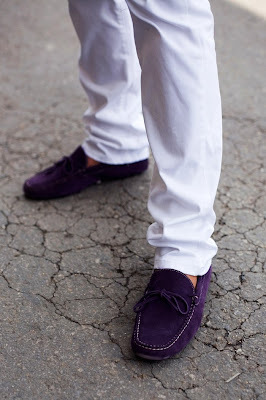 The versatile purple driving shoe-a fashion staple. Perfect with a suit or casual wear. Seriously, I love the purple shoes. Nice color palette in the first photo. I like the pocket square. I think I'm wearing those pants. You could quibble about lengths here but they don't bother me. It's summer. It's hot. It's casual. Don't quibble. Now what exactly is going on in the third photo. Is that a couple dressed alike? That's creepy. They don't look like mall walkers. What IS going on? mocassini the most confortable shoes for the summer time, I love wear them in all occasions also with my swimming wear.TOD'S is the best but carshoe is not bed.. Idea sounds good on paper but I can imagine never hearing the end of it if I ever rocked those. Those are TODs by the looks of the pebble soles. Purple mocs! Genious! I specially like them paired with white pants, very refreshing! Purple is, like, so June 2008. For August I would go for yellow or Celtic green. Except in Florence where the pics are from. In Florence guys love purple or viola since its the color of the local soccer team. But yes, it does work, doesn't it. And the kicker: in Florence you'll get a purple (or yellow or green) hand made in Italy, no-brand pair of suede mocs for 55€. i'm surprised by how much i like these looks, esp. the last one. i think most men would look silly in these shoes, but done well they are magnificent! ugh..must go to FLorence..for hand made shoes!!! not only are the shoes talk worthy but check out teh rest of their outfits!! i especially like the white one..but i don't get the third picture. there were TWO guys in white with purple loafers? it is also fashion accent. Diego Della Valle (Mr Tod's) also owns Fiorentina football club, whose team colour is purple, which adds a kind of synergy to the whole concept! please send some purple suede moccs my way (and not those ballet/mocc hybrids)!! Hideously perfect! I love them. definitely Car Shoe and I wouldn´t be surprised to know these guys are sponsored by the company (Prada by the way). looks good anyway . I just bought moccasins! I hope they're wearable for women as well, because the few times i've worn them so far they've been so comfortable i never want to take them off...plus they make my normally huge feet look small, something i greatly appreciate. What are the chances of two men in the same pace at the same time wearing purple mocs??? talk about a weird and very specific trend... i don't know if i'd be into seeing these on my man. perhaps green or traditional tan.. The plum moccasins in the first picture a bright, fun addition to an everyday prepster uniform. The purple looks lovely against the khaki pants. Well done! Purple moccasins! Who would have thought. I like it though! Purple seems to be the in color right now? oh i'm jealous, can ladies pull any version of these off? oh i'm jealous! can ladies pull any version of these off? I'm having a friend pick a pair of these up for me and send them over. I love them. Coloured suede driving moccasins are all over Selfridges at the moment. Tod's, Prada and some new brand called Fin's. Purple and chocolate seem the most popular. Question is whether you can justify driving loafers and driving gloves, or does that make you a dapper version of Alan Partridge? Seems purple is new man shoes color! Love it! I want 'em. Purple is MY color. But not with suits, no. Something more casual. The first man is yummy. I love it when people (espeically men) pull off intense color like that -- it shows such confidence, which exudes sexiness. Is this purple the "eggplant" I've seen during my recent online shoe-search? Lovely touch to any casual outfit. It's very effective in the same fashion flats compliment dresses. Cute, but destined to be a passing fad. Wear them with linen and cotton this Summer. In November, put them back in the closet, to be taken out for an "Aughts" party in 2016, then wear with impudence from 2021-24. I like these shoes...who makes them? Where can you buy them in NYC? i saw the exact same pair at Barneys NYC and they didnt have my size i was a bit heated! These men are fabulous! Those purple mocs are very inspiring! I've got 'em in orange and lime green but by Born - which is, eh-hem, more affordable than Tod's. I'm usually not a trendy or "fashionable" girl but really, these are so cool and casual, resistance is futile. If I can find them in this beautiful purple at an agreeable price I'll snap 'em up and keep my fingers crossed that they don't become a major trend. Purple is great neutral, goes with all summer colours and even better with dark neutrals like browns, greys and blues. We have been doing all variations of purple from lavender greys to deep aubergine for the home for the last 2 seasons. Great to see it on the streets. I think Mocassins should be banned anyway and seriously, these are a 'no pull' zone kind of fashion. Leave them for a Hollywood comedy with a way too big budget! this guy is dressed immaculately, jacket fits perfect, linen?, pocket square is a great romantic dash, car shoes and jean cut khakis rumpling at the ankle. these 2 fellows look smashing! Absolutely love everything about the top picture. More men in the US need to have this style. I actually seen a foreign exchange student wearing these exact shoes at my school about 2 weeks ago.... i think we are late here!! I love the palate of the colors, it all flows so well. I'm also noticing a shift in the manner in which sunglasses are worn. No longer are they solely to adorn the eyes or the top of the head. Ok, I can't find any via google, but I MUST MUST MUST have a pair. Preferably not Tod's because of the price point, but if anyone knows where I can buy them, please email me. I beg the question...Who makes these shoes? I've looked at Tods, Car Shoe and do not find this color. I have 2 pair of Tods in red, but the purple is a must have. purple being the colour of the local football squad (Fiorentina). The nickname of the squad is Viola, which is also the name for the colour. Anyway, what is really interesting about all this, is how the discussion in the blog goes straight to the heart of fashion and reveals its contradictions: people who want the shoes have recently expressed (in the discussion about men's accessories) how important it is to tell something personal about yourself by not following the dictates of fashion. Well... I guess it is all a matter of timing, isn't it? Very conventional but nicely put together outfits with the one "humorous" touch. I particularly like the low waistline on the first gentleman. But this most reminds me of PG Wodehouse and Jeeves. Hehemm, you're not planning on wearing that in public, sir? the man at the bottom looks elegant but the top man looks awkward. Secondly, the effect is much less stunning when the shoes are everywhere..more on the tacky side..reminiscent of the italian orange pants. Beautiful!, and the shoes are nice too. I wish my husband would wear these . . . They might have been Tod's Gommino mocs which at some point were available in "Rhubarb". I can find an old link to it on the Tod's site, but they don't seem to have them in the next season. Update: These shoes are from the Tods summer line, which are now out of stock. Agony. yes yes yes. regal-purple suede, seasonless and classic. i would snap them them up in an instant. these, and band of outsiders' collab with sperry, are why i wish i was 1) a man or 2) had man-sized feet. the white jeans but what's on top? Found them yesterday at Tod's in Dallas and Las Vegas. Thanks, donk. I ordered mine from Dallas today. Mine are on their way from Dallas, too! We've created a revolution! I persuaded my father to buy these shoes...he was glad to see other men wearing them! I've always thought purple is a great colour to incorporate in a look. Be it hair-stripes on a shirt, or a pocket square. But these mocassins really aren't working for me. In the first picture, he's bringing out some very olive-tones, and the purple really clashes, in the last picture the purple is just too loud for the light tones he has, at least in something as prominent as shoes. I can see purple mocs working, but I don't see them working in these outfits. I think those shoes are Tods because of the stlye. Awesome shoes. Purple moccasins! This is the meeting place for so many (fortunate or unfortunate) trends: the rise of JCrew style-loafers--see their mass production at Urban Outfitters these days--strange fabrics & colors, and the sporadic (and typically over the top) appeal of Native American-influenced clothing. Strange and interesting! check out the bagatt website. they've got some purple gomminos. love, love, love, love, love these shoes. They are a must have. anyone know where one could get these in the states? I love it Those purple shoes are great, they perfectly match with these outfits, especially on the last one. This stunning man just proves one doesn't have to wear a three piece suit to rock a pocket square. This outfit is put together so well. And his slippers just tops off his gorgeous look. Very daring! Not all people like to match their belt with their shoes. touche my friend, touche. I love so much those mocs!! I'm french but I'm living in Roma and I see very often guys wearing mocs and I love it, especially Gucci mocs. J'adore The Sartorialist, c'est LE site d'une VRAIE mode! Please forgive me because im sick. I've had near identical to these since September. Only difference is the absence of white stitching. Bought mine from carshoe for the bargain price of £195. These are really great... 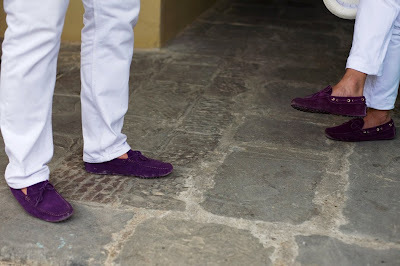 I just got a pair of purple shoes from the new STEFANEL Spring Summer collection in Milan... They look just like these, great quality and fabrics. Dang! This looks so good, I can't believe it! The perfect finishing touch to a beautiful suit!